Thriving mainly at the turn of the 20th century, this Exchange Street theatre was meant for the upper class. It hosted many famous theatrical companies of the time. The following are links about Worcester Theater you may find interesting. Also check out the other pages. The following are comments left about Worcester Theater from site visitors such as yourself. They are not spell checked or reviewed for accuracy. This looks like the old LOWES Poli Bldg at Main and Southbridge. The picture looks like the side of the building as it is today. This is actually the Olympia Threatre on Pleasent Street. The building still stands but the facade is all gone as are the stairs. This theatre is on Pleasant Street, about two or three buildings up from Main ST on the right (going West). The glass tower building (on the left) often obstructs one's sense of the first block of Pleasant ST, which has several historic buildings and seen from a side perspective is a great tribute to the old architecture still present in Worcester (take a moment next time while driving on Pleasant to see this theatre and the other buildings). Constructed 1904 now part of Hanover Theatre http://www.preservationworcester.org/pages/newsletter.html On March 14, the former Poli Palace Theatre will be opening as the Hanover Theatre for the Performing Arts. The new theatre will be an exciting cultural venue for Central Massachusetts and will feature Broadway shows, nationally renowned performers, and family and community events. The Southbridge Street theatre was constructed in 1904 with a nearly complete restoration by Thomas W. Lamb of NYC in 1926. In 1967, The Redstone Theatre Corporation of Boston purchased the property and remodeled it as the Showcase Cinemas. Major changes were made including creating a new entrance and removing the proscenium wall, upper seating boxes and parts of the ceiling under the balcony. Further, changes were made in 1973 to allow the simultaneous showing of four films. The current project which involves restoration and new construction will return the building as closely as possible to the 1926 theatre. The restoration of the historic façade which had been covered is a key component of the project and was a critical factor in the receipt of state and federal historic tax credits. Preservationist Leslie Donovan was brought in and she gave us an understanding about historic tax credits.– the criteria and what needed to be preserved. The façade of the 1904 theater, the Franklin Square Theater was the key. However, it had been covered over in the 70s, and no one knew what was behind it. We had an idea there was something there and so we had to take the side down and explore what was left. Would that be sufficient for the state and federal fax credits? The 1904 façade met the criteria - the rest of the exterior building was determined not to be of historical significance. (There was maybe 90x30 feet that we took down that was of no historical significance.) Before construction started, we needed get approval for the building to be placed on the National Register of Historic Places. We also had some challenges because we needed to comply with handicap regulations. In the 1926 section of the building, the floors sloped and we obviously needed some relief from some of the rules and regulations. If it were a brand new building, we would have different criteria. Being an existing building and on the historic register allowed us certain relief in the building code. Once that was put all together, the design started. 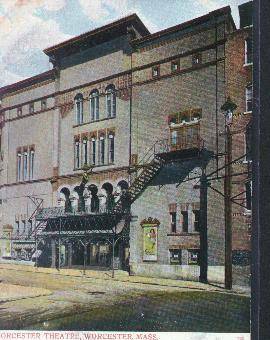 In 1919 it was listed as a hall "Worcester Theatre, Exchange street. 1338 seats." Frank Albrizio is correct. This is NOT the Hanover. My office window looks right out at the theater. It was called the Olympia. http://books.google.com/books?id=x701SWintW0C Dictionary of Worcester 1889 page057 Music Hall.—The Worcester Fruit Preserving Company was organized under a charter from the Legislature in 1867, with a capital of $50,000, for the purpose of erecting and carrying on an extensive fruit-keeping house under Prof. Nyce's patent. The officers were: President, Benj. Walker; Clerk, Elijah B. Stoddard; Treasurer, Harrison Bliss; Superintendent, John S. Ballard. The building, which was erected on Exchange street back of the Bay State House, was on the plan of a huge refrigerator, in which the various kinds of fruit, foreign and domestic, as well as eggs, vegetables, etc., were to be stored and kept fresh indefinitely. The enterprise did not prove a success, and the following year the Music Hall Association was formed for the purpose of utilizing the property in the erection of a theatre. The land on which the building stood had been deeded to the Fruit Preserving Co., by the Bay State House proprietors April 29, 1867, for $8,195, and this having fallen into the hands of Benj. W. Thayer of Boston, was deeded by him to the Music Hall corporation May 7, 1868. The latter had been incorporated April 14, 1868, and was composed of the following gentlemen: Harrison Bliss, E. B. Stoddard, Francis H. Kinuicutt, Edward L. Davis, Stephen Salisbury, Jr., Samuel Woodward, David S. Messinger, Wm. H. doubling, Benj. Walker, Orlando Tompkins of Boston, and Chas. В. Pratt. The fruit building, which was in the rear of the lot, was extended by an addition in front, the new part costing $18,950, and the whole transformed into a theatre, called at first Music Hall, but of late years known as the Worcester Theatre. It was leased March 1, 1869, for ten years to B. W. Thayer and Orlando Tompkins, at $6,000 per year for the whole building, which included two stores on the ground floor. A mortgage of $25,000 was placed on the property by the corporation, which organized with a capital stock of $26,800 divided into 268 shares. 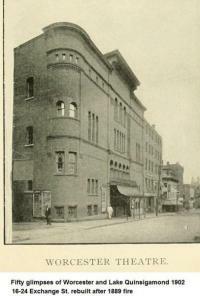 The theatre was opened on the evening of March 9, 1869, by the Boston Theatre Co., with the play of the Lady of Lyons. After the first lease run out the proprietors and others managed the theatre for three or four years, and in 1883 the late Charles D. C.Wilkinson assumed control under a six years lease at $3,750 yearly rent. His widow retained possession after his death till the destruction of the building by fire in May, 1889. Previous to the fire a lease had been given to F. F. Proctor for five years from Sept. 1,1889. The theatre is now being rebuilt. The capital stock of the Music Hall Company has recently been increased to $50,000. The corporation is now composed of A. George Bullock, President; William H. Morse, Treasurer; ami E. B. Stoddard, Francis H. Dewey, Geo. Sumner, Stephen Salisbury, and H. M. Witter. The picture is the then new constuction of "The Worcester Theatre of 1889". The two pictures displayed on this site ARE NOT the Lothrops's Opera House\Olympia\Fine Arts. These pictures are of the great and gone Worcester Theatre on Exchange Street. This is the second Worcester Theatre, rebuilt right after the original 1860's building was destroyed by fire in 1889. This was the "high class" legitimate playhouse of the period that saw most of the great stage actors of the 19th and early 20th century appear here. Does any one have any insight on the old Worcester catacombs which an entrance was thought to be I'm the old theater? AT Google Books I found this item from the April, 1915, issue of Worcester Magazine, published monthly by the Worcester Chamber of Commerce. It was in a column headed "Worcester a Quarter Century Ago": "Opening of New Worcester Theatre "The coming of modern drama to Worcester 25 years ago created no small stir. When tickets for the opening performance at the Worcester Theatre on Exchange street were placed on sale on April 21, 1890, the rush for the seats equalled the scenes outside a baseball park before the beginning of a world's series. "The sale began at 9 o'clock in the morning, and the night before the crowd began to line up as early as 8 o'clock. It hardly seems credible that several score of persons camped all night in front of the store where the tickets were sold, but that is what occurred. Several of those in line were "proxies," holding the places for persons whom they represented. "The theatre was opened on May 5, with a production of 'Shenandoah.' It was a gorgeous occasion." I found the address of the original theater burned in 1899 as 20-28 Exchange Street, opposite Waldo Street. There is a parking lot there now.